Appearance:White or light yellow Powder, almost tasteless. Use:it is suitable for various causes of hypothyroidism. 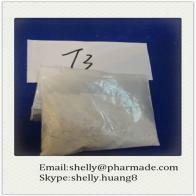 Our company is specialized exporter, manufacturer and supplier of Liothyronine sodium T3 Na Powder in 中国.